Before shot of the drawer. Before shot – the mess beneath the baskets! We have a draw of hair accessories and tools in our bathroom. 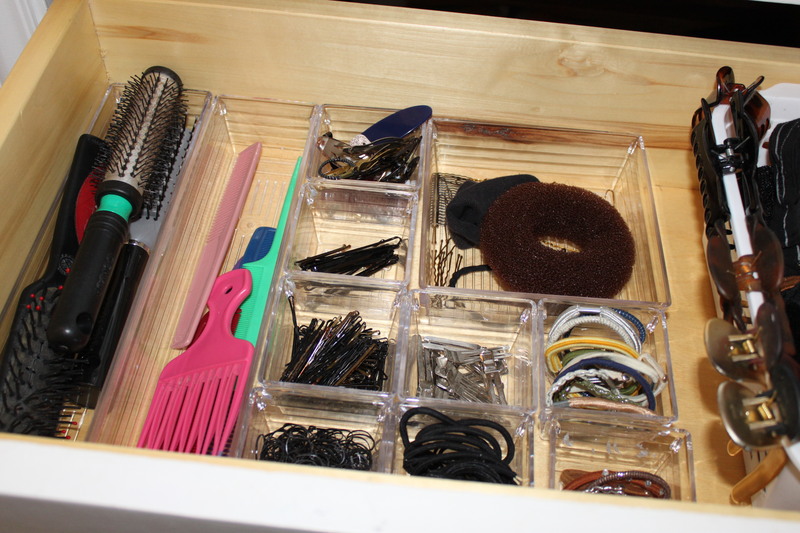 Of course, the males in the house do comb/brush their hair (at least sometimes), so the state of this drawer rests on Eden and I. When we first moved in, I set up baskets for everything, but over time it has literally become a “toss and go” drawer. You know, open the drawer and throw it in. Our collection of brushes has grown and most go unused, there are ponies that are so old they’ve lost their elasticity and half the time you must re-arrange things for the drawer to even close. Every time I wanted something, I would have to search through every basket to find what I was looking for and in the end would often discover that it was not in a basket at all, but sitting in the bottom of the drawer underneath them. It drives me crazy! Cleaning/organizing this drawer has been on my “to do” list for quite some time, but the drawer closes and this mess is really only known to those that live her, so it always seems to get pushed further down the list. 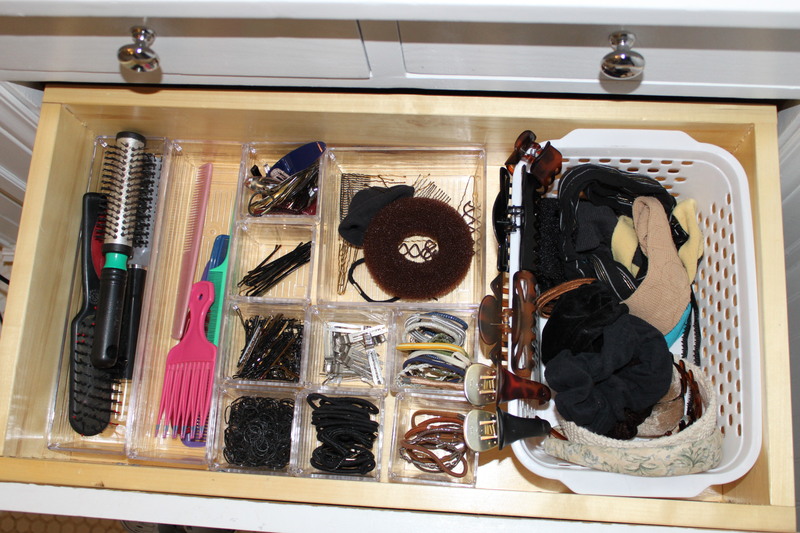 However, on one of my last dollar store trips, I decided that I was going to buckle down and get this drawer organized, so I bought some great little clear plastic organizing trays. I love the way the dimensions of these trays allow them to fit perfectly together without any gaps in between. 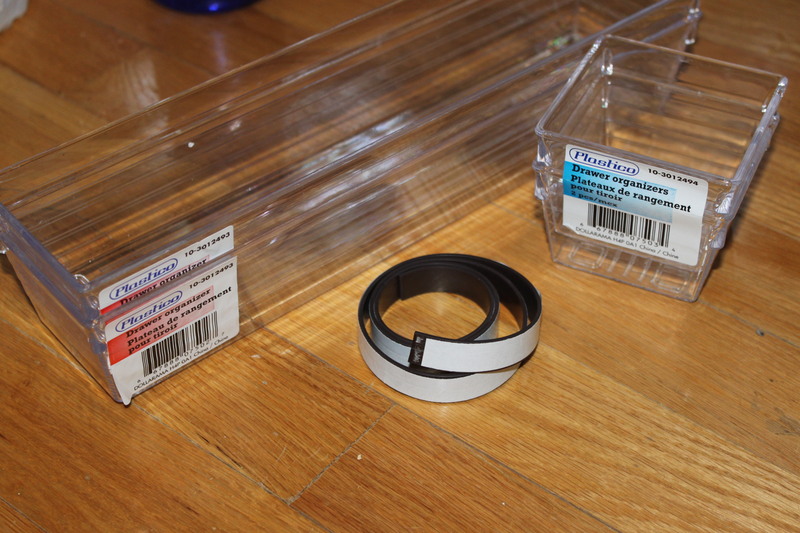 These are much smaller than the large baskets that were in the drawer before and they allow me to separate the various items into their own compartment. Love this!! This actually wasn’t much work, but took a while because I tested every elastic, checked the little ends of all the bobby pins and purged anything that was either garbage or not being used. Feels so good! My husband wasn’t that impressed and predicted it wouldn’t last the day, but it has been three, so I already proved him wrong! Here is the finished drawer. It sometimes amazes me when you do what seems like a minor job around the house and yet it just makes you feel like a weight has been lifted. Organized just feels good! !